RQ1 - What are the digital practices that pupils bring to their learning in school? The findings about children’s digital practices outside school need to be viewed in the light of the inevitably unrepresentative sample of children and carers who took part in this aspect of the research. All of the ‘log children’ lived in homes where ICT was readily available, including access to mobile devices and WiFi connected to the Internet. Playing games ranging from simple ‘arcade’ style games such as Snake or Angry Birds through to sophisticated use of virtual worlds such as Minecraft. Other ‘fun’ uses of ICT, including downloading and/or listening to music, watching videos/TV (often using a service such as Netflix or catch-up TV), reading e-books. In order to make sense of the vast array of uses of ICT, and equally importantly the ways in which children used it outside school, the Digital Practice Framework (DPF) was developed. 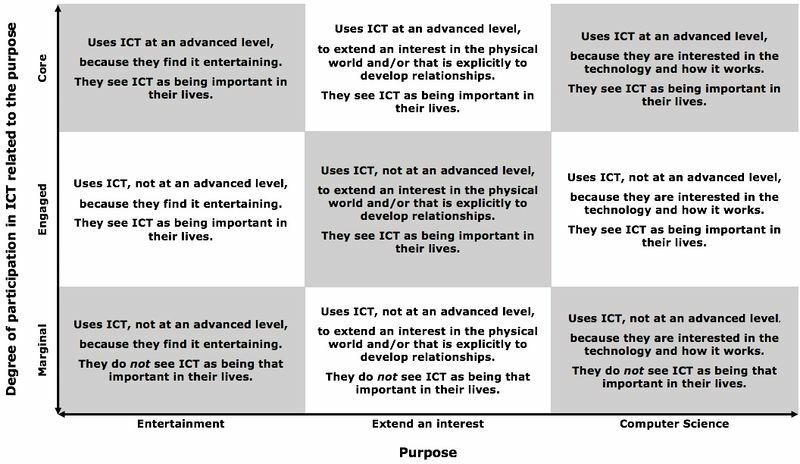 This encapsulated key aspects of children’s digital practices, which related to why they were using ICT (Purpose), and the level of sophistication of that use combined with the way in which they positioned themselves in relation to other users of ICT (Participation). Find out more about the Digital Practice Framework (DPF). A key finding was that there was a wide variation in levels of engagement and sophistication of ICT use. This was often due to constraints placed on the child’s use of ICT within their home arena or due to lack of support due to parents’ own levels of ICT competence and/or concerns about children using ICT. This challenges commonly held assumptions about the majority of children being highly competent users of ICT. Gender did appear to influence children’s digital practices. Another key finding, which is encapsulated in the Purpose dimension of the DPF, is that whilst the majority of children use ICT primarily for entertainment, others purposively use it to extend physical world interests. Children were agentic, they pro-actively and independently searched for information about things that they were interested in. See Section 6 of the meta-analysis report for a fuller discussion of the findings relating to RQ1. This page was last modified on 28 June 2017, at 13:30.